Why oh why are purple polishes so darn hard to photograph??? I had SUCH a hard time capturing the true colour of this gorgeous polish sent to me by Anita from KONADOmania in our swap. Please excuse the quality of the pics in this post as I had to play around with my camera settings. It kept capturing the colour as blue and not purple which really frustrated me! I must have taken at lease 2 dozen shots and the ones below are the ones closest to the colour in real life. H & M Liberty Girl is a gorgeous pastel purple creme. I love purple polishes and this is no exception! Unfortunately the formula is quite thick which made application for me really tricky. I must add some thinner to this for next time and hopefully application will be easier! The 1st coat is quite streaky but a 2nd coat evens things out however I still had some bald spots. Below is 2 coats without top coat and it dries to a nice glossy finish. I then used CM Nail Art striping polish in Pearl to draw 2 lines across the tips of each nail. In real life CM Nail Art striping polish in Pearl looks exactly like the name - it's a pearl polish off-white in colour with a pearl finish. However on top of Liberty Girl here, it appears silver which was unexpected and surprisingly I'm really liking it! I then placed some flowery fimo on a couple of fingers and topped it off with a coat of Nailene Acrylic Strong Topcoat. If you haven't entered my giveaway yet there's still time! Enter HERE! omg ur pics always amazing. what camera u using hun? I love the design you did on it looks good on you. I love the lavender and your designing is so super. @ipehishere: Awww thank you for the lovely compliment! I by no means am a good photographer, I just point and shoot =p I use a Canon Ixus 70 which is a couple of years old now but it's a great camera. It's such a shame that purples are such a pain! I'll wait to see your EOTD! @Rebie: It's such a nice colour, I'm glad you love it too. 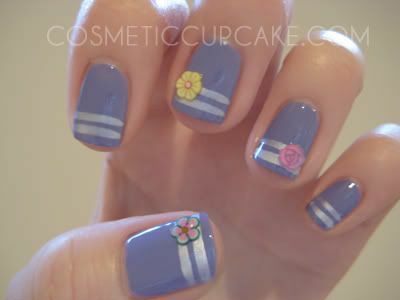 the lavendar color is great and you did a good job decorating your nails, it looks so professional!! Oh, I just love this!!!!! wow!! thats really pretty :D kind of reminds of easter eggs :) hehe loving the purple colour! Wow, this is so cute! I'm jealous that you have time for such pretty manicures! I've been busy cleaning and re-organizing my room all week! Love that purple shaded. I have to check it out at H&M this weekend. Thanks for the post! I love your fimo! I really need to try these. Love the purple ! :D and those stripes too . @Pop Champagne: Thank you! I'm far from a professional though =p Thanks for stopping by and commenting! @yardsticks 4 lunatics: Glad you like it Tiffani! @xAgnes: Thanks! Funny enough my boyfriend said it looked like Easter eggs too LOL. @Alice: It's only because I haven't been cleaning and organising my room that I have time! =p Glad you like it, it's such a pretty colour. @Cel: Thanks! Fimo clay makes an awesome addition to any mani. @Tassa & Ansa: Thanks ladies! @Lacquer Ware for Tips and Toes: Oh do try out fimo, it's so much fun! Thank you so much for the award! @Rebecca: Glad you like it! I'll be looking up American Apparel socks hehe. @Lily nail: Thanks! I'll be heading over to your blog and entering very soon! @Island Gal: Thanks! You too, hope you've got fun stuff planned!